Best for: All Preperation time: 35 mins. 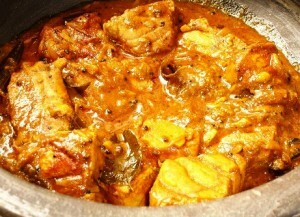 Fish In Sauce recipe by Dolly Tata at DesiRecipes.com. 2 pods garlic & 18 deseeded green chillies. Cook 2 chopped onions in oil,when they become soft, add ground masala & fry till roasted. Add this to the onion /masala mixture with 3 cups of water & stir nonstop to a smooth gravy. Do not let it thick. Wash the fish slices & boil them slightly. Add the slices to the sauce with salt to taste. Shake the pan so that fish do not break.If the sauce thickens, add some fish boiled water to the consistrancy you want. Garnish with chopped corriander & fried sliced onions. This sauce is to be eaten with yellow fluffy rice, accompanied with papadams & pickle.